Volume 3, Number 7 of the first student newspaper on the CSUSM campus. The cover story reports on new campus policies. 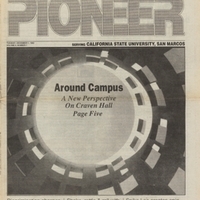 This paper also includes a special spread called Pioneer Explore covering a 8.3 earthquake and campus events. December 1, 1992,” University Archives at the CSUSM Library, accessed April 20, 2019, https://archives.csusm.edu/student-newspapers/record/54.